Abstract: Quantum communication and computing have recently emerged as candidates for the development of methods of information processing beyond the bounds imposed by classical (Newtonian) physics. For computation, Shor's algorithm could be used for breaking the ubiquitous public-key encryption protocol, though a demonstration of a quantum computer of sufficient complexity to be of interest for this application is likely to be many years off. For communication, quantum mechanics enables fundamentally secure communications—meaning communications whose security is guaranteed by the laws of physics. But major obstacles exist to the further development of these fields: (1) quantum systems are intrinsically fragile, their delicate coherent properties being destroyed by virtually any interaction with either the environment or other nearby quantum states; (2) precise analog control across a complex system would be required to achieve large-scale sustained error-free computation; and (3) the low-loss transmission and detection of distinctly polarized single photons across large distances either in fiber or in free space is technically challenging. The combination of enormous potential application with a correspondingly enormous technical challenge makes this an exciting and growing field of inquiry. This talk will provide a review of the principles of quantum information processing and describe development of superconductive device elements for application to these fields. Work at MIT’s Quantum Nanostructures and Nanofabrication group focuses on two distinct challenges: (1) the development of fabrication technology for superconductive quantum computing elements; and (2) the development of high-speed (greater than ~ 1-GHz counting rate) nanostructured single-photon detectors for quantum and classical communications applications. In this seminar we will also present our research into fabrication technology for nanometer-length-scale superconductive single-photon detectors. These devices require patterning with sub-10-nm line-edge roughness and sub-100-nm-width wires, meandering in a tightly-packed pattern to achieve a fill-factor greater than 50% in the final device. Ultimately, integration with an optical cavity and a readout transmission line is also required. These fabrication constraints must be met without damaging the 4-nm-thick epitaxial NbN layer from which these devices are sculpted, which greatly narrows the set of available fabrication tools and techniques. Once successfully realized, these detectors should be useful in any application where high-speed single-photon counting is required, for example in electronic-circuit diagnostic microscopy and in ultra-long-range free-space communications. Biography: Karl Berggren is currently an assistant professor of electrical engineering at Massachusetts Institute of Technology, Department of Electrical Engineering and Computer Science, where he heads the Quantum Nanostrucures and Nanofabrication Group. He is also currently associate director of the Nanostructures Laboratory in the Research Laboratory of Electronics. 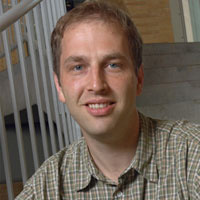 From December of 1996 to September of 2003, Prof. Berggren served as a staff member at MIT Lincoln Laboratory. His current research focuses on methods of nanofabrication, especially applied to superconductive quantum circuits, photodetectors, and high-speed superconductive electronics. His thesis work focused on nanolithographic methods using neutral atoms.